For years, my body has taken very good care of me, taking hours of hard training everyday with hardly a complaint. My last (and only) injury was in high school. My spirit, on the other hand, has been much more delicate. I have often pushed myself to emotional failure, which can be as debilitating to training progress as an injury. For me, it looks like crying 30 minutes into an easy session and feeling overcome with fear at the thought of a hard workout. And over time, even as I have recovered from those individual periods of exhaustion, I built a fear of pushing too hard. Peak emotional exhaustion occurred in the lead up to the 2016 Olympic trials. I put an immense amount of pressure on myself to perform, while also increasing my training volume, losing 10 pounds, and getting inadequate sleep. When I decided to continue rowing for another quadrennial, I knew that I had to break that cycle and figure out how to train and live happy. I took a big break after trials in 2016 and came back in not great shape. Fall of 2016, we made some big changes to my training program, backing off a lot. I wanted to create a baseline of training where I could execute every workout, every week, without failure. And that place feels good. It's comfortable. It's fun. But it also doesn't produce improvement. And I almost got lulled into staying there... until I went down to Philadelphia to try out some double combinations and got pushed way out of my comfort zone—hard pieces two days in a row, with three practices (including a lift!) on the second day—and didn't break down or fail. After that trip, I started to push my boundaries a little bit. In the first three months of 2017, I averaged 680 minutes of training a week. 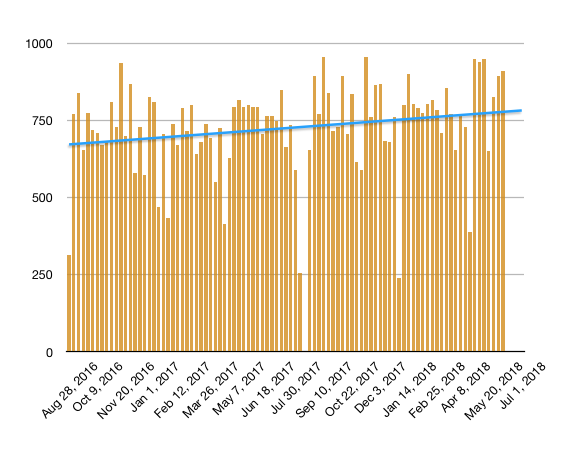 In the three months after that trip (May, June, July), I bumped my average up to 750. It felt good to struggle sometimes. But I was still only allowing myself to struggle through individual training sessions. And my improvements were still small. In the fall of 2017 and early 2018, I stepped up to 775 minutes a week, but I also fell back into a comfortable rhythm. I was still avoiding some of the workouts and back-to-back combinations I feared the most. I was still backing off instead of pushing through. I went to the first race of the 2018 season and I didn't perform as well as I needed to. I raced the same way I had trained—afraid. I find it ironic that my fear of failure ended up causing me to fail. But it also lit a fire. I came back the following week and wrote a training program that included all of the things that scared me the most. 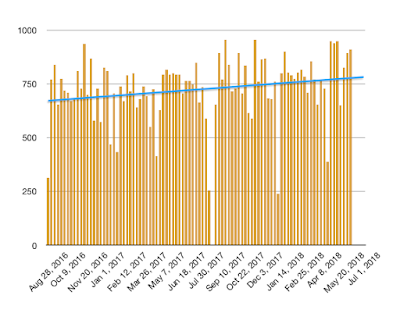 The first three weeks were 950 minutes each and over the last seven weeks I've averaged 875 minutes. I scheduled Guenter's crazy circuit lift on Monday and Thursday afternoons, with a really long, hard endurance session on Tuesday morning. I did two hard sessions every Saturday. And week after week after week, I checked off workouts. Two weeks ago, I executed a week that felt like everything I'd been building towards for the last 18 months. 900 minutes. Crushed all of my lifting sessions. Did two sets of hard pieces and some speed work. Worked hard, got tired, recovered and adapted. Boat rigger or neck pillow? And here's the thing, it wasn't that bad. Yes, my body hated me a little bit on Friday morning. And yes, we did all three 750m pieces with the tailwind on Saturday. But I hit great paces on all three sets of pieces, knocking a few seconds off my previous best times. I have no idea what the rest of the season holds for me. There is a lot of great racing ahead and I'm looking forward to finding out what I can do. I still need to work on a lot, especially my headspace. Fast splits scare me and my self-confidence can be pretty flaky. And, despite the help of Jasyoga and consistent practice, I am not great at switching between the aggression of working out and the calmness of working in. But most importantly, I'm excited to be back training at this level, and doing it from a place of joy rather than obligation. It's been a difficult journey these past two years trying to find love and purpose while also chasing speed and intensity.